Okay, so I love art. I love children’s art. I’ve been waiting so very long to introduce Ellie to painting and making art and hoping beyond hoping she would enjoy making art. I didn’t have to wait any longer. Yesterday I picked up some finger paint at a local school supply store and thought she might be ready. 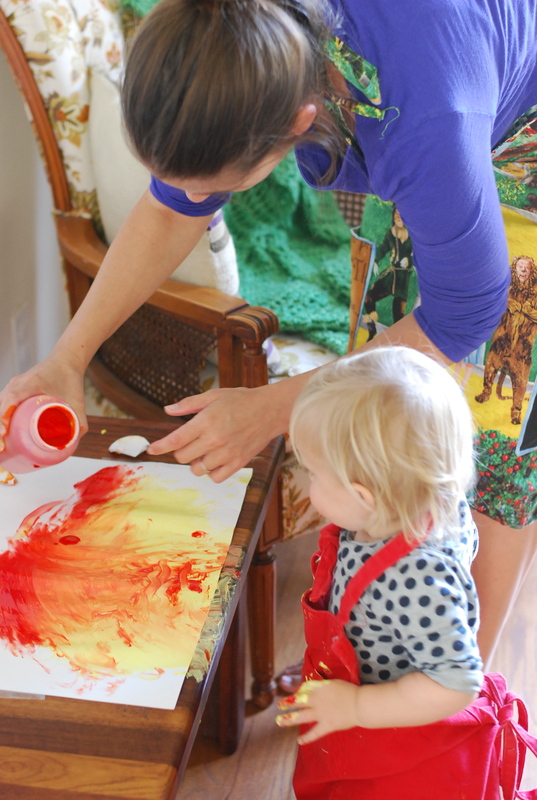 This morning I set her up at her table, put her in an apron that was ten times too large for her (she didn’t seem to mind after she watched me put on my, yes that’s right, Wizard of Oz apron), and we got to painting. 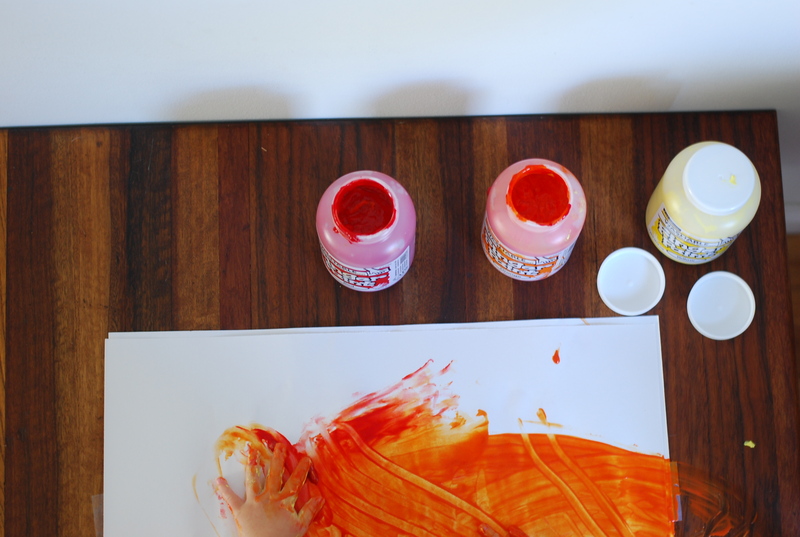 It was as if she had always been finger painting. She went right to work, smearing her hands across the paper, trying out different strokes with her fingers and really staying focused on the task at hand. 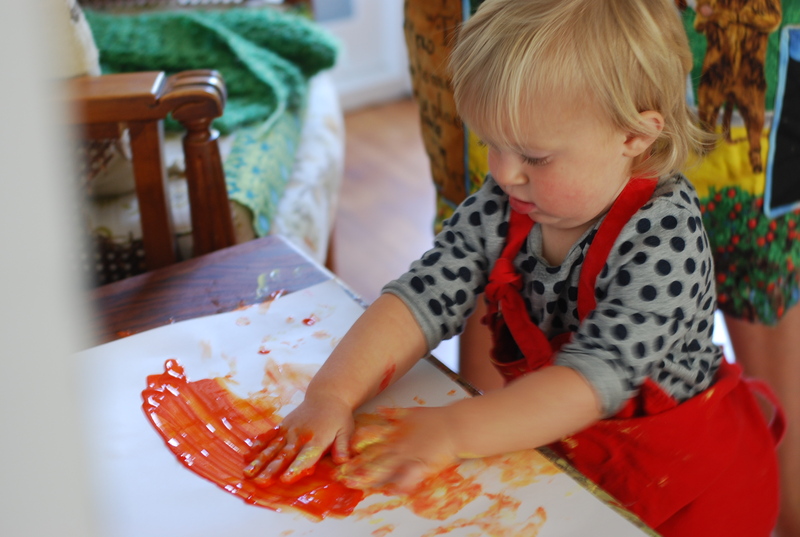 She seemed to thoroughly enjoy her first experience with painting. And that makes this Mama very happy. 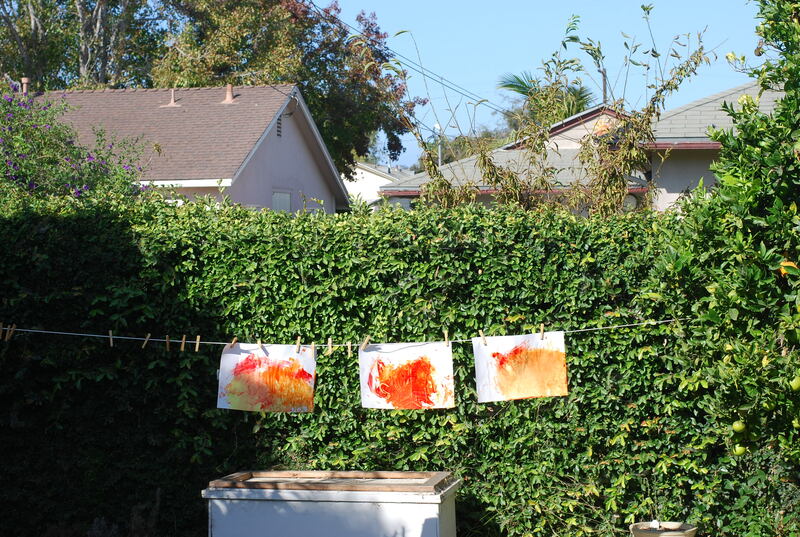 There will be more art in this home… that I am sure of! *thanks to Jeff for taking many of these photos today, helping me to document the fun stuff! 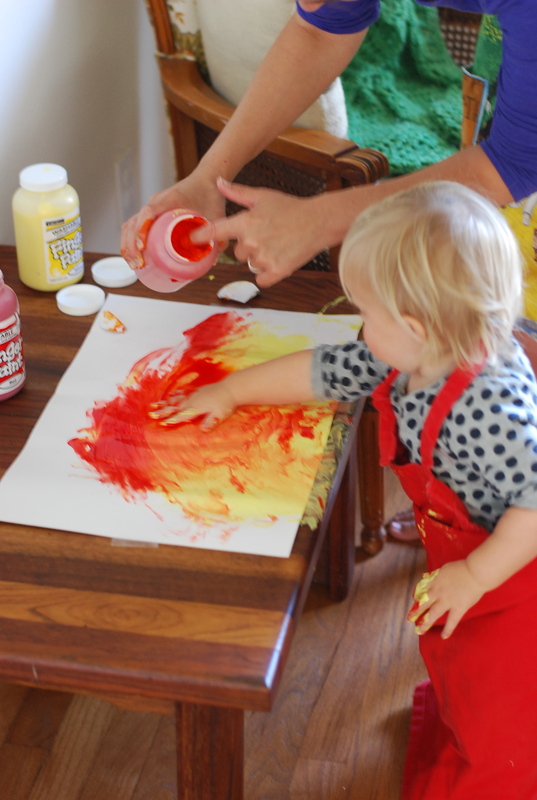 This entry was posted in making and tagged a budding artist, first painting experience, painting with toddlers, the process of finger painting. Bookmark the permalink. sweet! so fun. 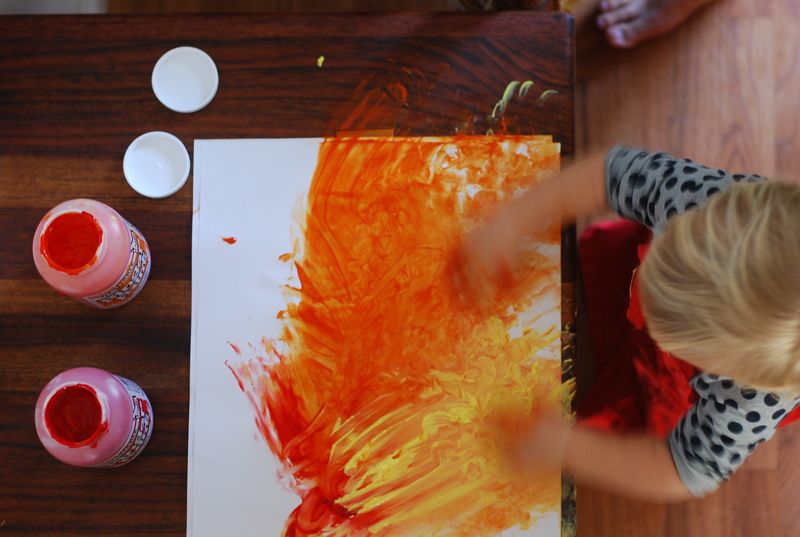 I remember that transition into art with my littles. 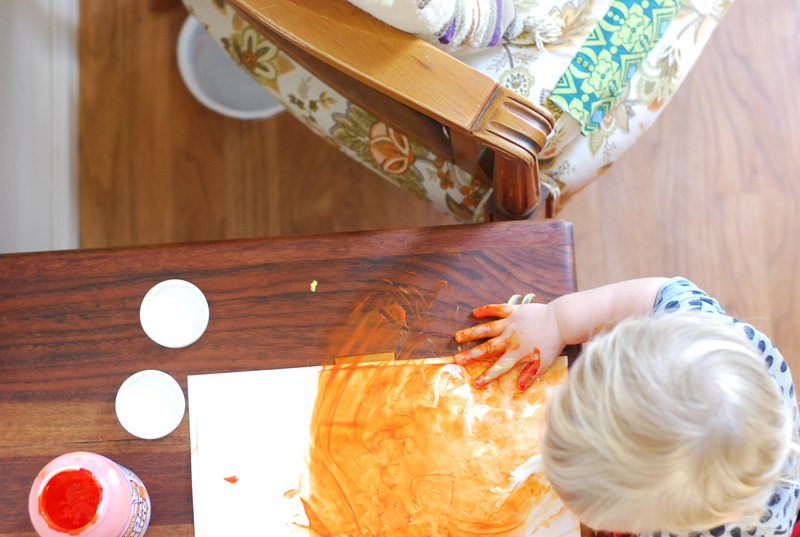 another fun thing is to cover the dining room table with paper (you can do the rolls of paper to make it quick and easy) and have the whole family draw together on a big space. 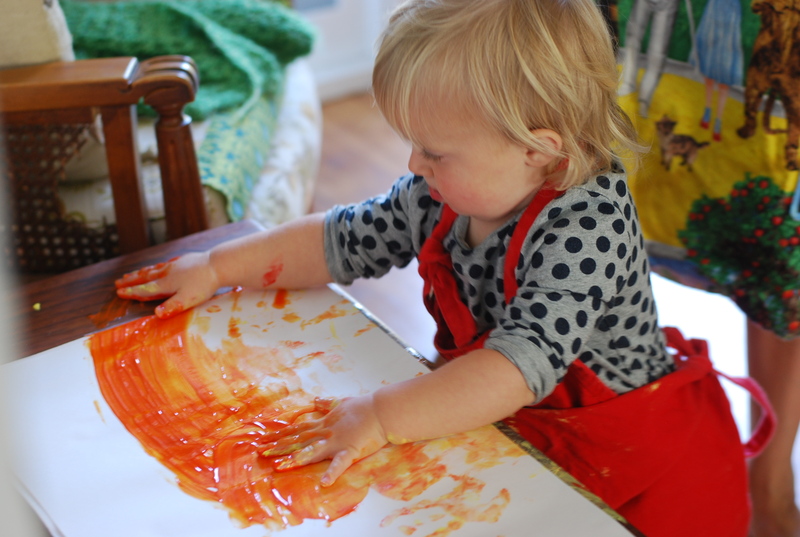 love messy babies making art! we’ve also played like that with our hands, it’s so funny! adorable. I cringed slightly at that beautiful table getting paint on it although I am sure it was easy to wipe up. I picked up a cheap $1 plastic (yuck I know) table cover for painting that I can just wipe down. I love when they get to the art/crafting age. I’m hoping to do lots with Aerilaya this winter as she is at a good age for crafting projects.